This is from July 2010…but that does not make it old news. AMY GOODMAN: We continue with Goldman Sachs. AMY GOODMAN: The author of the article, Frederick Kaufman, joins us now. He’s a contributing editor at Harper’s Magazine. Well, explain. We’re talking about Goldman Sachs today, this — they call it a landmark settlement, but they made more after-hours in trading last night than they will have to pay. So let’s look at Goldman Sachs and its record overall. FREDERICK KAUFMAN: Yeah, this is really — it’s really outrageous. And on a certain level, this reform bill is really a sham, because it does not cover, in any way, shape or form, what Goldman Sachs — and really, let’s be honest here, it wasn’t just Goldman; it was Goldman, and it was Bear, and it was AIG, and it was Lehman, it was Deutsche, it was all across the board, JPMorgan Chase — what these banks were able to do in commodity markets, really which reached its peak from 2005 to 2008, in what is now known as the food bubble. And as Juan points out, this is unconscionable what happened, in the sense that their speculation and their restructuring of these commodity markets pushed 250 million new people into food insecurity and starving, and brought the world total up to over a billion people. This is the most abysmal total in the history of the world. JUAN GONZALEZ: Now, what were these commodities markets like before the Wall Street firms got involved? And you have a haunting picture, especially of the Minneapolis Exchange, what it was before, what it was like. Could you talk about how things operated and then what Goldman Sachs did precisely? FREDERICK KAUFMAN: The wheat markets, in particular, in this country are the outcome of a process of development of over 150 years. And that is why, from about 1903 to 2003, the real price of wheat in this country has gone down. And this was one of the great reasons for America’s great twentieth century, the fact that we had cheap food, we had cheap bread. And Goldman, in 1991, came up with a new idea and a new product, which, as I said before, completely restructured this market and completely threw it out of whack. But before we go there, we just have to maybe review for a second a little bit about how these markets worked and what kept that wheat price stabilized. And Juan, you mentioned the Minneapolis Grain Exchange, this kind of obscure syndicate in the Midwest, which is where the price of this particular kind of wheat, hard red spring wheat, which is the most widely traded wheat in the world, and it’s the most widely exported wheat from the American continent — we kind of set the world price on this wheat. This is where it happens. What’s the history of that price being stabilized is you have, traditionally, in the wheat futures market, two kinds of players: one of the farmers and the millers and the warehousemen — right? And this, of course, includes players like Domino’s Pizza and Sara Lee and General Mills, very large business, capitalist stakes are in this wheat market, right? And they are called bona fide hedgers, because they’re actually buying and selling real wheat. 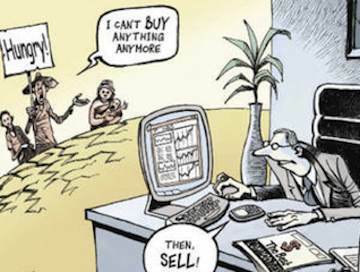 As the price fluctuates in the futures markets, you also traditionally have speculators in this market, people who don’t want wheat, who wouldn’t have any place to put it if they bought it, but they’re making money off buy orders and sell orders, as the price fluctuates each day, and hopefully they’re bringing in some money for themselves every day. That’s the idea. Now, the key here is that both the bona fide hedgers and the speculators, every time they buy, they’re also selling, and every time they sell, they eventually buy. So their positions are cleared off at the end of the day, OK? Goldman, we have to understand, and a lot of these banks, are not interested in the particular structure of any of these markets. I think it’s a lot of mistake people make when they think about how these bankers are working. We think that they’re actually interested in the markets. We think that they’re — no. What they’re after are very large pools of cash for themselves. They’re after accumulating huge pools of money that they can do with whatever they like on a day-to-day basis. Right? And so, Goldman, in 1991, came up with this idea of the commodity index fund, which really was a way for them to accumulate huge piles of cash for themselves. It wasn’t really about the markets, anyway. The market was just an excuse. And so, the fact that they threw these wheat markets out of whack didn’t really matter to them. JUAN GONZALEZ: Almost ten times its historic price. FREDERICK KAUFMAN: Yeah. It was just completely out of control. And, of course, the irony here is that in 2008, it was the greatest wheat-producing year in world history. The world produced more wheat in 2008 than ever before. And here’s the other outrage of it, which is that at the time that Goldman and these other banks are completely messing up the structure of this market, they’ve protected themselves outside the market, through this really almost diabolical idea called “replication,” which is what I discovered when I was looking into how they had structured this. What they do -— let’s say, Juan, you want me to invest for you in the wheat market. You give me a hundred bucks, OK? Well, what I should be doing is putting a hundred bucks in the wheat markets. But I don’t have to do that. All I have to do is put $5 in. Good-faith promise. And with that $5, I can hold your hundred-dollar position. Well, now I got ninety-five of your dollars. What am I going to do with them? Well, what Goldman did with hundreds of billions of dollars, and what all these banks did with hundreds of billions of dollars, is they put them in the most conservative — no fools, they — they put them in the most conservative investments conceivable. They put it in T-bills. And then what did they do? Well, now that you have hundreds of billions of dollars in T-bills, you can leverage that into trillions of dollars. This is what I’m talking about, large pools of cash for themselves. 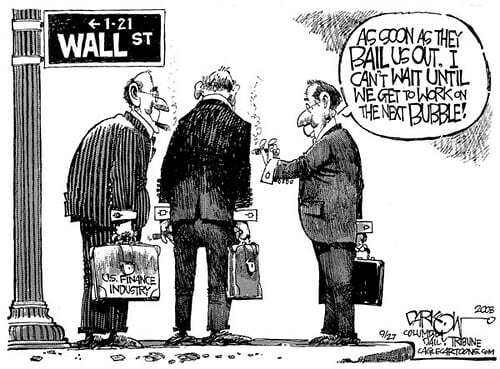 And then they take that trillion dollars, they give it to their day traders, and they say, “Go at it, guys. Do whatever is most lucrative today.” And so, as billions of people starve, they use that money to make billions of dollars for themselves. JUAN GONZALEZ: And the result was, as the price went up, that there were food riots around the world. JUAN GONZALEZ: And what about the human dislocation that occurred? FREDERICK KAUFMAN: Yeah, in 2008, there were food riots in more than thirty countries. The global price of food rose over 80 percent. This had an effect not only on wheat, but on corn, on soy, on cooking oil, on rice. You know, people talk about globalization. “We don’t need to set prices or have tariffs, because we’re globalized. You know, people can buy their wheat, anyway.” Well, gee, guess what happened. When the price of wheat started to go through the roof, something new, which was something old, came up, called “nationalism,” and people said, “OK, sorry, we’re closing our wheat, and we’re setting up tariffs.” And you had — you had riots. You had hunger. You had a disaster. You had a global disaster, because, remember, in America, we’re spending maybe 15 percent of our weekly paycheck on food, right? I mean, maybe you remember, a couple years ago, why was that dozen eggs so expensive? Why was that milk so expensive? Why was that meat so expensive? That’s 15 percent. For most people on the earth, they’re spending more than 50 percent of their daily income on their daily bread. And when their daily bread moves up 80 percent, they’ve just moved right into the ranks of the food insecure. And it was not only in Burkina Faso. This was in America. You had 49 million hungry families in America. You had one out of five children in America at soup kitchens. You had a million hungry people in Los Angeles. So, I mean, it is unconscionable that Wall Street has completely lost touch with the reality. They’ve forgotten that there is their mathematical formula, there’s virtuality, on the one hand — “Gee, I can make a lot of money by making a formula” — and on the other hand, there’s reality. There are real things that they are affecting, and they’ve completely forgotten about it, to devastating effect. AMY GOODMAN: What do you think needs to be done? FREDERICK KAUFMAN: Well, the solution is interesting, and it certainly is not going to be solved by the financial reform bill we’ve just seen, because, of course, the people I talk to at the Minneapolis Grain Exchange and all over, they’re already prepared for every single trade being exchange-traded. The people at the Minneapolis Grain Exchange have already prepared 50,000 exchange-traded slots for anything that people want to trade. Now, when I was talking to the hedge fund guys and the traders and all my contacts on this, and I said, you know, “What if Wall Street — I’m sorry, what if the federal government regulates you?” they just laugh. They literally laugh. They scoff at federal regulators, because they’re like, “By the time they get around, they figure out what we’re doing, we’re so far beyond it.” And in fact, the commodity index funds, the long-only commodity index funds that I looked at now, they’re already dinosaurs. They’re onto second-, third- and fourth-generation reiterations of this. There’s no way the federal government is going to be on top of them, because they’re so far ahead. So, what’s the other possibility? The other possibility is simply outlaw it, say, if you’re a bank, you’re not allowed a stake, you’re not allowed a stake in actual commodity markets. And I said to these guys, you know, “What if they just outlaw you?” And once again, rather unsurprisingly, their reaction is outright laughter, because it takes them about ten seconds to get over that problem. Either they make a phone call to London and do all their trading out of the London Exchange, or they do an over-the-counter swap with a Cargill or a Nestlé or a bona fide hedger, and it’s taken care of. So what’s the solution? I think the best solution that’s been floated around in Washington in the groups I’ve been close to is an actual international or national grain reserve. I mean, we actually in this country, before this kind of mania of deregulation, had a farmer-owned grain reserve under the Clinton administration, real grain held back, so that in times of a bubble like this, regulators can say, “Look, you know, we have plenty of real wheat. Here’s a hundred million bushels of wheat. We can bring it to the market. We can bring that price back into a stable band.” And this is, I think, in some ways, the best solution: real wheat to counter virtual madness. JUAN GONZALEZ: Well, yet, as you were saying, that the Wall Street firms are always able to devise new ways to get around regulation. I was reading in today’s paper on the new bill, the financial regulation bill, that the banks have already devised new methods. For instance, that they are no longer able to charge such exorbitant interest rates on credit cards, so now they’re going to begin imposing fees on checking accounts. And they just come up with an immediate new solution to keep making huge amounts of money and getting around the regulators. So, even with this reserve situation that you raise about creating grain reserve, are there potentials for the Wall Street firms to figure out a new way to continue to control and make money off the food supply? FREDERICK KAUFMAN: Well, I think the theory behind what you’re saying, Juan, is called “market capture,” in the sense that whenever you have a group of people, be they in the auto business or in the healthcare business, whenever they fear regulation from the government, this group is, of course, the most at-risk group. They are the ones who put more of their resources into understanding this regulation than anybody else, more of their lobbyists, more of their money into understanding what’s going on, and therefore, they’re the ones who ultimately — the people whose interest it touches most intrinsically are the ones who then capture that reform, market capture. So what I like about the grain reserve is that it’s actually outside of the purview, outside of the financial purview. As I said before, it’s no longer in the realm of the virtual; it’s no longer in the realm of the numbers. It’s actual real wheat, and you can actually bring it to bear. You can bring it to markets. There was a complete madness for hard red spring wheat in 2008, when you had international orders coming in from Nigeria, from all over the world, and there literally was the perception that there was no wheat out there. And so this thing, as you say, goes up and up and up and up and up. If there is actually somebody who can say, who can bring real wheat and calm these markets, you’re going to save lives. It’s not just that you’re going to save mortgages or that you’re going to save, you know, finances; it is that, literally, you no longer have those outrageous numbers of starving people on earth, most of them women and children. , “How Wall Street Starved Millions and Got Away With It.” We’ll link to it at democracynow.org.